It's been a month or so since I have sewed anything, but today was the day I randomly decided to make a red pillow. Just a red pillow was all I was going to make. A simple red pillow for the couch. I made the simple red pillow (well, actually there is some blue and cream ticking fabric on the back half of the envelope closure, because I ran out of red), plunked it on the couch and BOOOORING!!! I'm not a particularly great sewer, I haven't mastered much beyond a pillow, but what I love about sewing itself, is the creation of something so unique, so "you"... the antithesis of a mass produced object! It's those unique touches and creations that really make a house a home. adorable and fits in with your delightful style! rah rah rah! still waiting and will keep you posted! That's just so sweet and so fantastic! I love the personal story behind it....makes it that much more special. Very very cute and I love the campy feel to it too! Its a great memory pillow that tells your story. 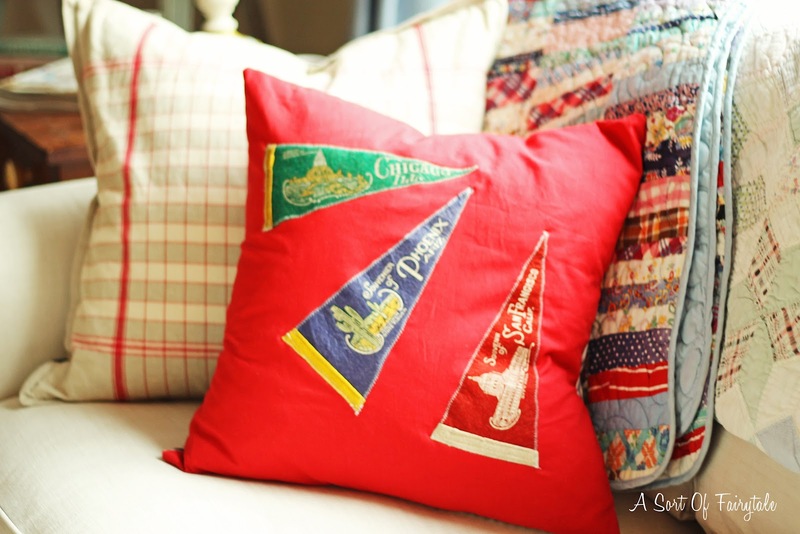 Love the sentimentality with your pillow AND it's stinkin' cute too! Well done! You are only going to get better at sewing if you keep practising. Little projects are the best way to learn! Just perfect. So unique and meaningful. Great look and great job! It looks really cute and (don't be offended) the sort of amateurish look makes it seem very authentically vintage...like a girl made it in sewing class for her boyfriend or something... I LOVE it. Sometimes that simple look is just right. It fits perfectly with your vintagy shabby decor! How sweet! A souvenir pillow made by you. 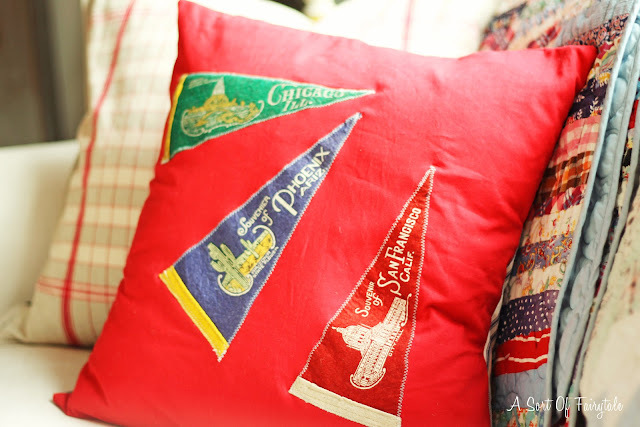 I see those pennants in antique stores and would love to do a Christmas tree skirt out of the bigger pennants. It would probably take me years to collect enough to make one! 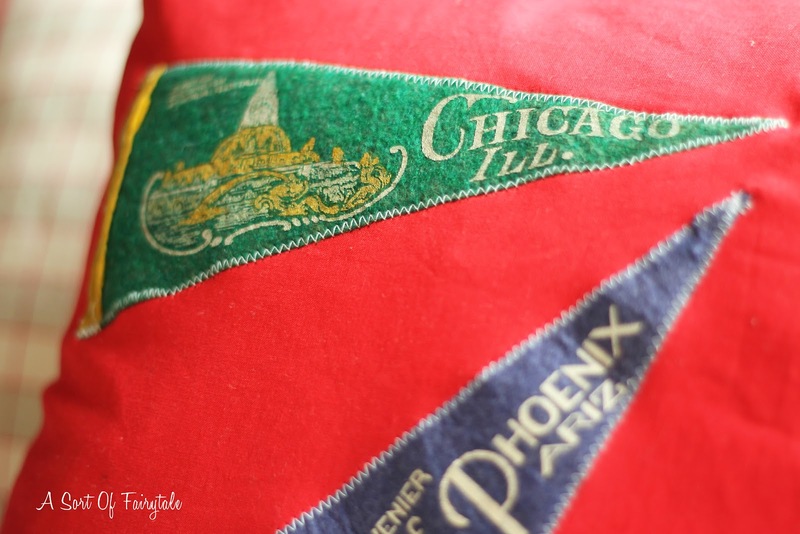 Your vintage pennants are the perfect touch. Love the sentimental value too. what a perfect way to store these memories and relive them. Cute pillow! You're right. So much better than mass-produced. Love the quilts too. A. Stinking. DORABLE!!!! I'm now on the hunt for some pennants and placing my order in advance! I love those mini pennants - I only find the big ones! What a perfect little pillow! Stacey, SOOO CUTE! Great idea to personalize your pillow. What a great pillow... love all the memories sewn in. 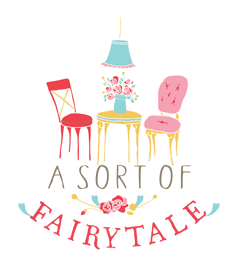 Have not been blogging lately and I always love when I pop in you have a cute new header. This is such an awesome idea! I LOVE IT!!!! I am not a sewer but I do believe that I am going to challenge myself with this project...ours will be all about baseball or should i say all about the NY YANKEES!!! : ) hugs and thanks for the inspiration! love the pennants, miss stacey. so, sew sweet! aren't you glad cooler weather is finally moving in? 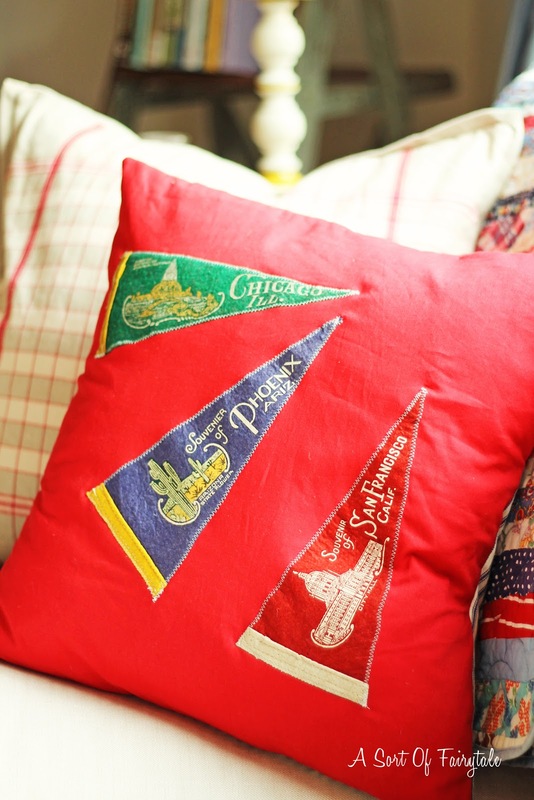 I love the addition of the vintage pennants... what a fun pillow and perfect for your living room! You may have started a new trend. ;-) Hope you are having a wonderful weekend.